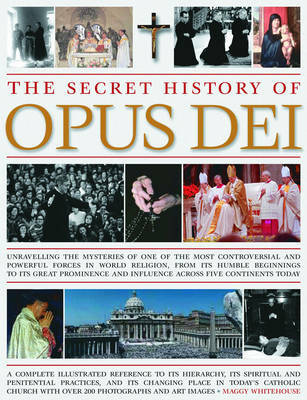 Opus Dei is perhaps one of the most controversial religious organisations of our time. For many years, there was little information about its history and development. More recently attempts have been made to make its structure and organisation are now much more transparent. For some, however, the organisation is seen as a powerful and shadowy institution with wealth, influence and many dark secrets. This revealing book aims to find out the truth behind the myths and the speculation, and examines the faces and personalities behind its institution. The book begins by explaining the beliefs of the Catholic Church and the Opus Dei's relationship with the Vatican and the Pope. It shows how the members of the Opus Dei aim to adhere to the teachings of the Church by following a daily plan made up of spiritual practices such as Mass, reciting the rosary, spiritual reading and prayer. To the most committed, this includes a vow of celibacy, a life of penance and the practice of bodily denial, sacrifice and self-mortification. The book then sets out to discover the practices, ideology, goals and structure of the organisation and to uncover its roots. It shows how the Opus Dei sees itself as committed to creating a deeper spirituality in our world today and its positive involvement in charity work. It explores the areas where the organisation has been criticized - for its fundamentalism, religious intolerance, conservatism, anti-feminism and recruitment methods - but also discusses how the organisation is moving forward and looking to the future. This penetrating book presents a global perspective of the Opus Dei that considers the organisation's influence on a worldwide scale and reveals the truth behind this powerful institution. Beautifully illustrated with over 200 stunning images, it is essential reading for all seekers of truth.